Pre-purchase your yearbook now for only $20! Update your directory information, provide emergency contacts, join parent groups, and make your Fall Pledge at the same time! 2018-2019 Yearbooks For Sale Now! What is the Kensington Education Foundation? 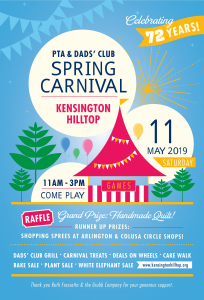 The Kensington Education Foundation (KEF) is a 501(c)(3) non-profit organization, established in 1983, with a mission of delivering academic enrichment programs to Hilltop students. The organization supports educational programs that supplement and extend the academic offerings funded by our school district. The KEF also provides financial resources to help Hilltop School mitigate the impact of changes to academic funding at the state and district level. The School Site Council (SSC) is composed of the school principal and 8-10 parents, teachers and other staff selected by their peers, representing all segments of the school community for the common goal of supporting student success. The SSC does this by developing and monitoring the implementation of the schoolâ€™s plan known as the Single Plan for Student Achievement. The SSC also determines how certain funds received by the school for this purpose should be spent. The SSC members are the principal; teacher representatives; other staff representatives; parents/other community representatives, and student representatives at the secondary level with each group selected by their peers.